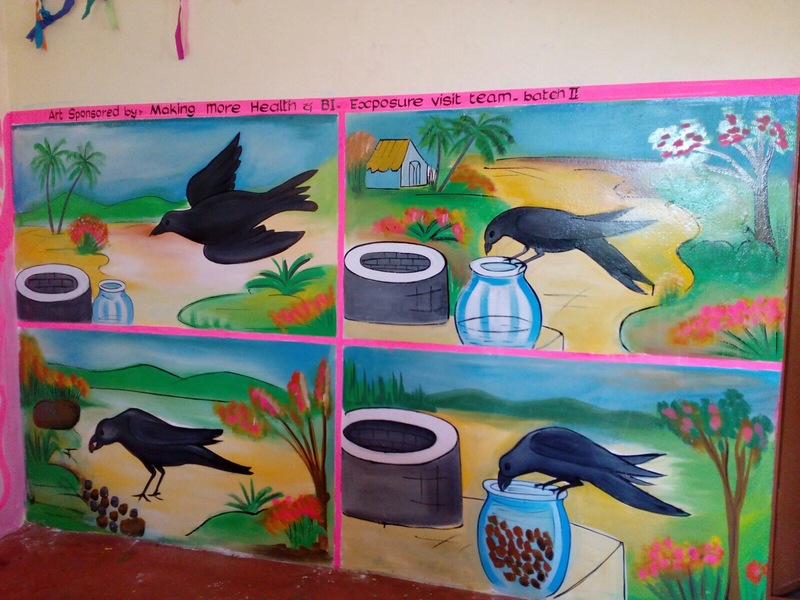 Colourful kindergarten paintings in India and an innovative learning culture for better managers – Go India, go future! In a few villages there are some new kindergarten buildings, too. The children, teachers and village people are very proud of these new buildings. The kindergarten buildings are small, but nice: Besides a toilet, a smokeless chullar for cooking and a healthier room without wet corners there are often water and electricity available – with some interruptions, but mostly it works. Yesterday, I got some pictures from our MMH kindergarten. Some of our managers had left a small donation during the last exposure trip with which we could finance some indoor paintings. What we offer are disruptive leadership trainings where managers can learn “out of the comfort zone, out of the traditional business world” and get in contact with societies and people in need, learn about realities in emerging market places, understand better the needs and become active drivers of a better world where business solutions help to solve social problems. Together with traditional organisations from the social sector who do a great job in the development sector. Here, in India, the local NGO has helped a lot to make this collaboration happen. The kindergarten paintings for sure do not change the world, but they show that change is possible if social and business people act together. And that there is a win for all and much more possible. The colours of the paintings are intense, clear shapes and focused topics. The messages are obvious and learning intents are always included. Just have a look. Traditional paintings for kindergarten children here in Tamil Nadu are animals, letters, numbers – often small picture-based stories, nice, encouraging messages for children. There is e.g. the story of the bird trying to get some drinking water out of a bottleneck glass . It seems to be impossible, but he makes it – with brightness and patience. Everything that is shown on the walls has a clear learning intention and message behind. The paintings in the few new kindergarten in the area are similar. Often there are a lot of schooling elements in it… But a lot of colourful life, too. I like them. It just comes to my mind how we would react in other parts of the world when we should decide on the right wall paintings…. people, parents, teacher would even discuss if the right colours, the right animals, the right values are shown. It could lead to endless discussions. In the rich world. When I have received the photos of the paintings and known that they have finished the work I really enjoyed. It is a very special Indian gift for me – this one, today. Today, we celebrate Christmas in Europe. I’m happy to know that the paintings are there – for the children in Tamil Nadu. Previous Post Social thinking in the core business? Create the passion first, the rest will follow! Next Post Happy New Year and welcome to a Better world! Pingback: My preferred Indian Christmas picture | Go India, go future!